Apple might be trying hard to promote the iPhone 5c, but the Cupertino, Calif. company’s latest smartphone advertisement instead draws attention to content creation on its flagship handset, the iPhone 5s. Called “Powerful,” the ad can be viewed now at Apple’s YouTube channel, and we’ve included the video below for your viewing pleasure. As usual, the new advertisement has launched alongside a brand new Apple Web page: titled “You’re more powerful than you think,” the page shows off some of the apps used in the ad (which include the popular Star Walk, Word Lens, and Pacific Rim). The apps used in Apple’s “Powerful” ad. You have the power to create, shape, and share your life. It’s right there in your bag. Or hand. Or pocket. It’s your iPhone 5s. If you cant see the above video, please click this link. Apple’s less intense iPhone 5s advertisements have also included a heartwarming holiday-themed ad which aired in December, and a Touch ID-focused advertisement for the handset which aired back in October. In addition to this, a series of print ads for the iPhone 5s also showed off the handset’s Touch ID fingerprint scanner and its gold color option. 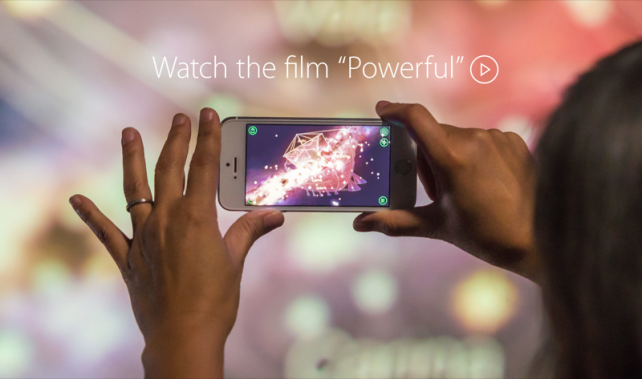 You can check on the Web page for Apple’s “Powerful” new ad by clicking this link. See also: With iOS 7.1.1, Apple Makes It Even Clearer Which Titles Offer In-App Purchases, Logitech Introduces A New Ultrathin Keyboard Cover For The iPad Air And iPad mini, and Get Eco-Friendly On Earth Day With These Green Apps.